Reach your customers at their home or in their offices with direct mail services from Print-Tech Inc. Direct mail works. The statistics are pretty compelling. It is the most preferred form of marketing, according to research done by MarketingSherpa. Roughly 98% of people bring in their mail the day it’s delivered, and 77% sort through it immediately. Last year alone, the USPS processed over 154 billion pieces of mail. At Print-Tech, we’re intimately involved with mail. Customers have us handle their mailings regularly. It’s one of our specialties. Unlike some printers, we don’t outsource the crucial services needed to execute a mail campaign – we do it all in-house. One powerful mail technology available at Print-Tech is Tech-Mail Plus. It infuses your mail campaign with a tracking mechanism that broadens your reach across the Internet. A snippet of code is also added to your website to track visits from your mail recipients. This code generates pop-up ads on hundreds of sites that a person then visits. It’s truly revolutionary. What Mailing Services Does Print-Tech Offer? 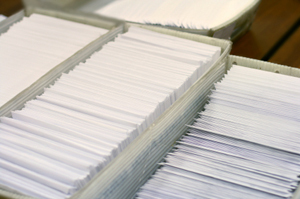 We help ensure your mail campaign is ready for the postal service well before your job’s printed. This saves you considerable time and expense, because the USPS has a dizzying number of strict mail-processing regulations. As experts in mail piece design and formatting, we’ll advise you about the different classes of mail, database integration for personalized mail, mail permits, postal discounts, and optimum timing. How Deep Is Our Mailing Expertise? Both of our on-staff mailing experts have earned the Mail Professional Certification issued by Idealliance, the leading not-for-profit industry association for developing standards and best practices. And one of them was previously on the executive board of the Ann Arbor Postal Customer Council. Planning a direct mail campaign is complex because so many variables affect the price, the speed of delivery, and the success rate. We’ll look at the design of your mail piece, make recommendations about any changes needed, and ensure that it meets postal regulations – all before we print it. We add “mail intelligence” to your campaign, too. We know how to break up a large mailing by region logically, based on postal rates, delivery dates and volume. When it’s warranted, we’ll recommend staggering your large mailing so that responses don’t overload your call centers. The best way to create an effective mail campaign is to work with mail professionals. We’re ready to help. We’ll print, mail, and assemble your campaigns right here at our facility, providing you expert advice, outstanding service, and fast turnaround. to start your next project.